I present to you the engineering equivalent of peanut butter and jelly: A self-driving vehicle that was 3D-printed. A prototype is currently being tested, and in the future, it could shuttle jet-lagged passengers across terminals or hungover college kids across the quad. 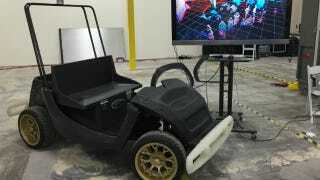 Researchers at the University of Michigan announced the vehicular jackalope yesterday: SmartCarts, custom automated “cars”—though they’re more like golf carts at the moment—3D-printed and summonable via smartphone. The vehicle uses a golf cart’s power train, but the rest of it is 3D-printed out of the same plastic used in Legos (acrylonitrile butadiene styrene, a cheap engineering plastic). UMich worked with Arizona-based tech company Local Motors for the 3D printing. So, why 3D print the thing? Because it’s way faster than traditional forms of manufacturing, so it can speed up the prototyping process for an experimental technology like autonomous cars. Which is exactly what’s happening here: If SmartCart needs a new tree-finding sensor installed, for example, the team can easily 3D-print a more accommodating dashboard in mere hours. Goodbye assembly line. Local Motors is the same company that unveiled one of the world’s first 3D-printed cars last year. In 2016, they hope to start selling low-speed 3D-printed cars that look more like the real thing than golf carts. Local Motors is also leading the way in 3D-printed car mass production: In the next 10 years, they want to open 100 “microfactories” across the world, which look more like maker workshops, and produce these kinds of futuristic products for local communities. Since SmartCart goes golf cart speeds, it’s designed to ferry folks across campus-like environments. Think amusement parks, airports, universities, stadiums, the like. It’s one of three models that’ll be tested on-site at the university’s robotic car testing ground. It’s a regular Venn diagram of emerging technologies. Right now, tech companies are scrambling in the race to get self-driving cars on the road, and some of them are already looking to get self-driving, on-demand taxis available to consumers, too. And this 3D-printed car from the University of Michigan may be a useful stepping stone to that, since it’s low-speed, low-safety risk, and can be experimented with in the controlled confines of a university campus, which is kind of like a mini city. If we had these when I was in college, it would’ve been used for many-a-bar crawl. Correction: An earlier version of this story referred to the car as SmartCar, when the actual name is SmartCart.